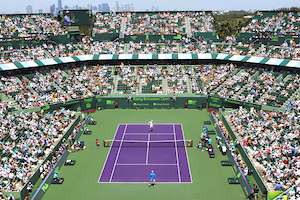 For his part, Ferrer fought off Jurgen Melzer in three arduous sets for his third semifinal berth at the Sony Open, last being in 2006. In the fifth game of the initial set, Haas captured the break at love for a 3-2 lead. Later, Haas banked a marathon game for 5-2 and stretched his advantage by a double break. Although Ferrer wrestled one of the breaks back, Haas still closed out the opening set. In the seventh game of the second set, Haas double faulted to hand Ferrer a break point. The Spaniard capitalized to move ahead 4-3. 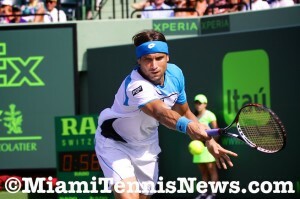 Subsequent to consolidating, Ferrer broke Haas for the second straight time to push the match to a decisive set. The start of the third set was a rollercoaster as the competitors traded breaks. Haas finally held serve to seize a 3-1 lead. However, Ferrer would not be discouraged. He went on to knot the set at 3 all. Down the road, courtesy of a double fault by Haas, Ferrer grabbed a 5-3 advantage, The Spaniard had no trouble serving out the set to clinch his spot in the Sony Open final. This week has been a case of multiple guys in their thirties going deep into the tournament, Haas explains “It comes down to, the older you get you would assume you get wiser. Now with nutrition, the right training, the physios, it just helps you, mentally, knowing that you’re putting in the work”. old now in the top 100 like never before, just because you’re eager”. Ferrer was broken his first two service games of the last set and down 1-3. Regardless of the score, the Spaniard maintained belief “I tried to fight every point. I know Tommy was a little bit more tired than me. But when I started the third set, I served very bad. . . I tried to forget and to play”. Ferrer pocketed his maiden Masters 1000 trophy last season in Paris. Ferrer is keenly aware of the significance of making it through to this final saying “I am very happy for that. I will try to do my best to win Sunday. It’s going to be very difficult. . . I need to play my best tennis against Richard Gasquet or Andy Murray. Both players are very good players”. Ferrer and Murray are evenly match with the latter having a slim 6-5 edge in their matchups. On the other hand, Ferrer has dominated Gasquet with an 8-1 record versus the Frenchman. Murray and Gasquet battle in the night session to see who will meet Ferrer on Sunday.